★ I put を together. A carrot, a green pepper of 5 millimeters - 1 centimeter shred it. 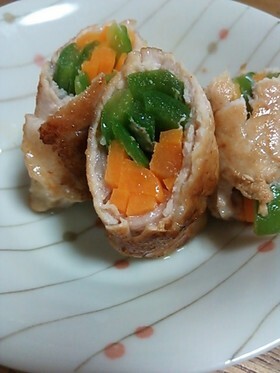 I open pork loin and ride ,② and wind it up. I pour oil into the frying pan a little and burn ,③ from the joint. I let ,① coil itself if fire carries and am completed. It is pointed by the joint side that I bake it!